When I was pregnant with my first child, I felt that my husband and I were communicating pretty well regarding the new family member that was about to enter into our lives (even though we really had no idea what we were in for!). Once we got into the labor room, neither of us were sure what my partner could do to help me cope with the pain, so I was very thankful to have others present who could help us navigate communication through the power of touch. The uncertainty of how he could best support me and our new babe extended into the postpartum period as a result of choosing on-demand breastfeeding. He had to go back to work and for six weeks of maternity leave, we struggled with our new normal. The second time around, we are equipped with a lot more knowledge and support. Prenatal partner yoga can facilitate in the process of knowing more about how partners can communicate and work with each other through pregnancy, labor and new parenthood to have a more loving, positive experience during one of the hardest years in a relationship. Lack of sleep plays a huge role in how we communicate with our loved ones. Expressing love and gratitude even in the depths of exhaustion really puts our practice of yoga to the test in a substantial way off the mat. 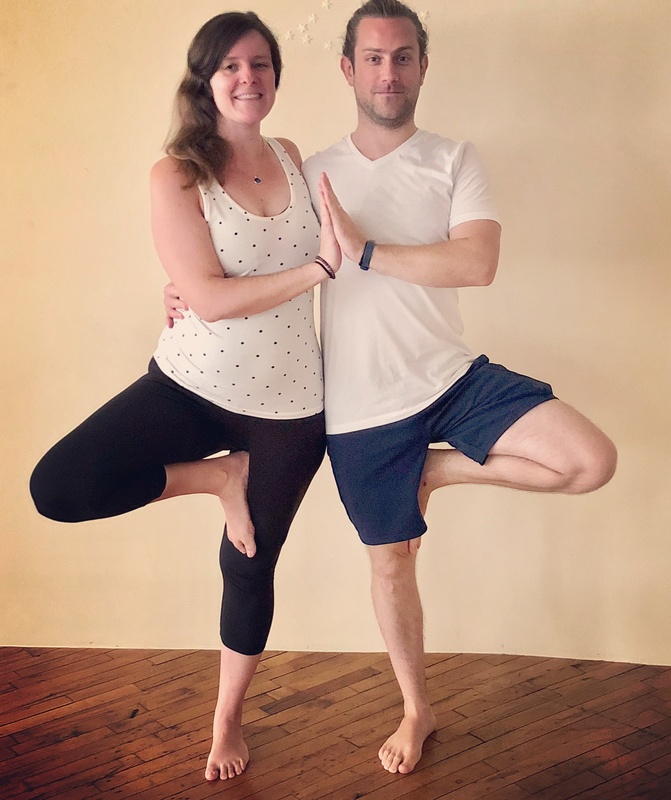 The movement, breathing, meditations and visualizations that you’ll do with your partner it in our upcoming prenatal partner yoga workshop will help prepare you for everything I’ve mentioned above and more. Today, it’s very easy to feel isolated in pregnancy and new parenthood, but it does not have to be that way. Come to this workshop and find a community of people that are going through many of the same things that you and your partner are experiencing. And in our last 30 minutes together, we will sit down and enjoy a light, healthy lunch and learn the essentials of optimal nutrition for pregnancy. If we can start healthy eating habits now, we will be more likely to carry those habits into new parenthood. Self-care is key to better serving our growing family. My husband and I will be co-teaching this workshop on Saturday, September 15th from 11am-1pm at the Yoga Loft of Bethlehem. I too will be 31 weeks pregnant and look forward to meeting you and your partner there!